Eventually here it is! 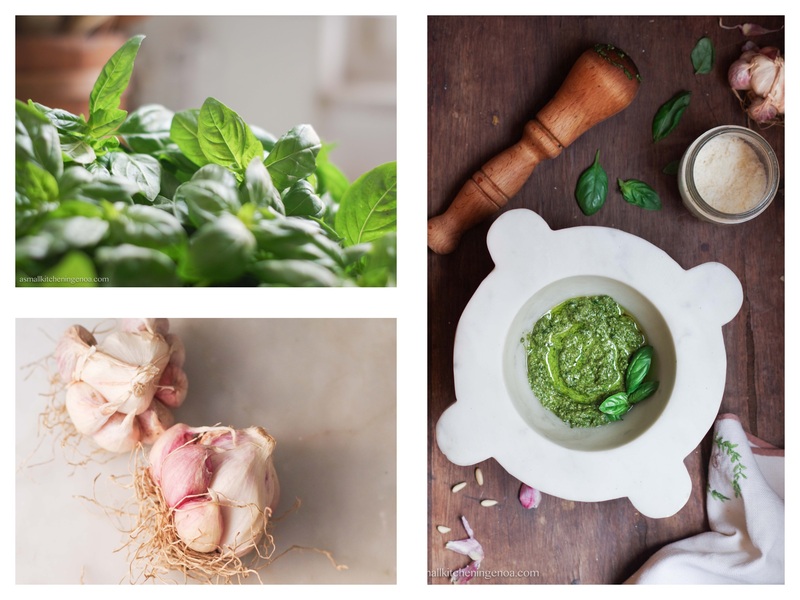 This is THE article where you will eventually find out all you must know about Genoese pesto: the right ingredients, the right tools, the original recipe and all the secret tips & tricks of Genoese cooks on how to make pesto. 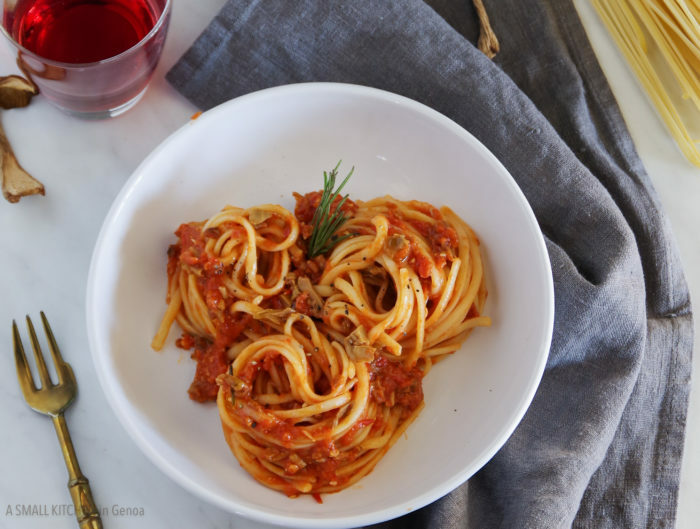 After having read this ultimate guide to pesto sauce, you will be ready to prepare it as local and obtain the very flavour of a real Genoese pesto! BASIL –Basil first of all. It must be very fresh, preferably with small leaves which gives a gentler taste and not that minty. Smaller leaves are better as you can crush them easily in the mortar. In Genoa we traditionally use basilico di Pra type. The best one is that originally grown in Pra, a small area just outside Genoa, as well as that grown along the slopes clinging on the sea along the coast between Genoa and Savona, such as in Celle Ligure at Azienda Agricola Paolo Calcagno. 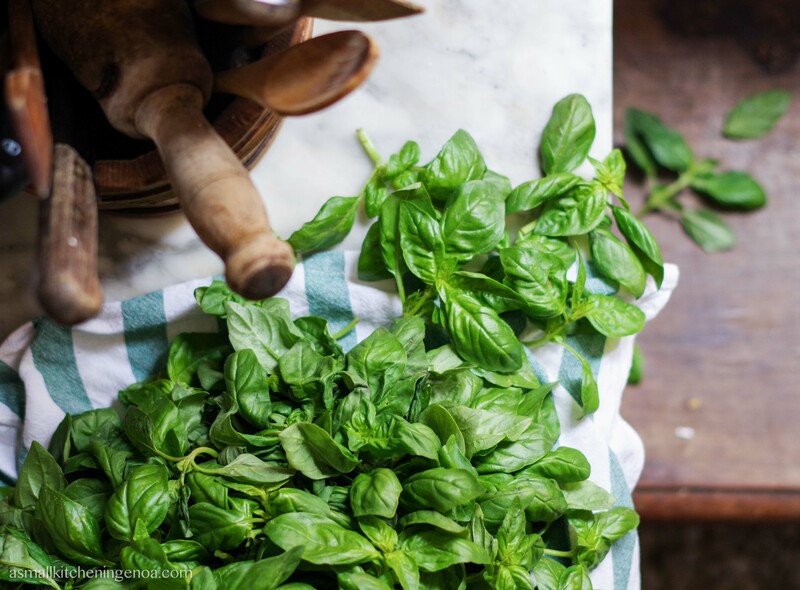 Leaves should be washed only if necessary (organic basil will be the best option), as washing them removes some of the essential oils that give pesto its aromatic flavour. If you wash them remember to dry them very well with the salad spinner before making your pesto sauce (especially if you do it in the mortar: water in fact makes the operation of crunching quite difficult and the pesto too watery). If you can’t make pesto just after shopping, the best way to preserve the freshness of the basil even for a couple of days is the following: clean it with water, dry it with the salad spinner and put it in a metal pan, close with a lid and keep it in the warmer part of the fridge. 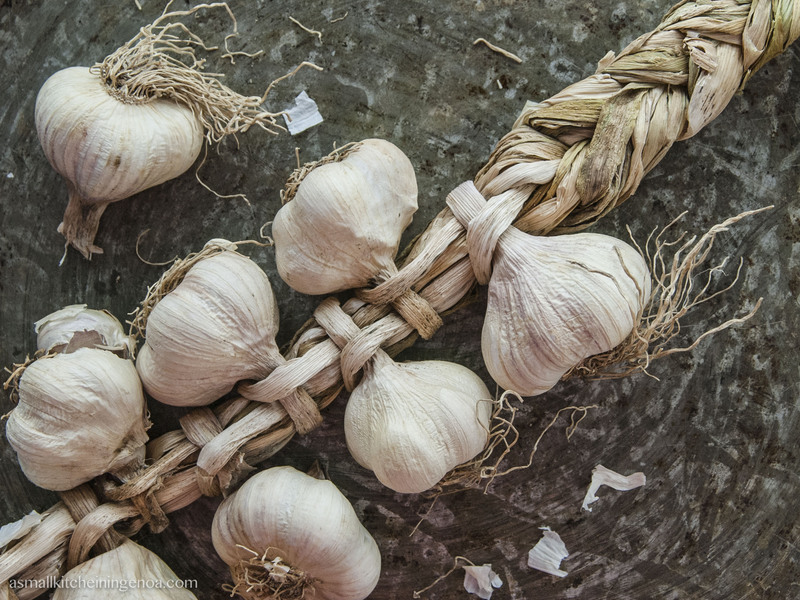 GARLIC –If you use “new garlic” (on the market – in Italy – generally from July to December) you can indulge without risking a too powerful pesto as it is less pungent. If you use “old garlic” (you find it on the market from January to May) it is better to use less, as it is more pungent, and to remove the inner green bit which is very strong and can cause indigestion. In any case garlic must be adjusted while making pesto in order to obtain a balanced flavour. Finally, quality of the garlic is quite important in the recipe because it doesn’t really get cooked. In the Italian Riviera original pesto recipe the right garlic is the one grown in Valle Arroscia (a valley in the backcountry of Albenga, Italian Riviera west coast) and named Aglio di Vessalico. It has an intense spicy and sweet flavour and special organoleptic qualities that makes it very digestible. PINE NUTS – All Italian Riviera sauces made in the mortar bears some nuts inside, always. This is a heritage from the Arabian people, with whom Genoese did business for many centuries. In some part of the Italian Riviera pesto is made also with walnuts. No shame for this, all the traditional recipes must be respected. However, the authentic Genoese pesto sauce is made with pine nuts, preferably the one cultivated in Tuscany, from Pisa precisely. They are quite expensive, but the good news is that you don’t really need many to make your pesto (a couple of spoons may suffice). Pine nuts are important because they give a sweet flavour to pesto and confer a certain creaminess due to the oils that they contain. CHEESE – Some recipes call only for parmesan cheese, some add also matured pecorino cheese (which is more spicy and salty). In this case the proportion should be 1/4 pecorino cheese and 3/4 parmesan cheese. Somebody prefers a more “rude” pesto and uses more pecorino than parmesan (in the last year spent holding pesto cooking classes I actually discovered that I love some pecorino cheese in the pesto, it gets a stronger personality). In any case, as to parmesan cheese, it is better to choose an old parmesan cheese (matured at least 24-30 months). Old parmesan, indeed, melt better with the sauce and gives a more defined and harmonic taste. Young parmesan, on the other hand, tends to get sticky when heated and will cause your pesto to stick to the bottom of the pasta plate. EXTRA VIRGIN OLIVE OIL – The perfect oil is an extra virgin olive oil from the Italian Riviera, which is delicate and not too pungent. Olive oil plays a very important role in pesto sauce: it melts and amalgamate all the ingredients, encapsulate the essentials oils given off the basil leaves and prevent your pesto to oxidize keeping its sparkling green colour. MARBLE MORTAR AND PESTEL– These have been the main tools of Genoese cooks for centuries, the only mean for smashing food. Traditionally, therefore, pesto is made in the mortar. You can do pesto in the food processor, of course. However, notwithstanding the progress made in the last century, pesto made in this way still have a taste and a look far better than pesto made with a food processor. This because basil leaves in the mortar are actually “torn up” by the pestel and not cut. In this way the green essential oils contained in the basil leaves come off perfectly. Furthermore, the marble of the mortar is cold and this prevents the oxidation of basil. Pesto made with the mortar, therefore, is definitely tastier, more scented and pleasantly light green. – Sometimes before making pesto put the food processor bowl and the blades in the fridge to make them very cold. – Use the food processor intermittently. In this way the blades revolving will not cause too much heat. – If available use an immersion blender, don’t ask me why but the pesto comes off better. As to the pesto recipe using the food processor, the ingredients are obviously the same, though for making pesto sauce in the food processor it is advisable to double or triple the doses (you can then stock the sauce in the freezer for even a couple of months). On the other side, ingredients shall put in the food processor in the following order: garlic, pine nuts and half of the extravirgin oil. Mix until they become a cream. Add basil and mix. Add cheese and mix. Add the second half of oil but gently melt with a spoon (in order to avoid the oil emulsify). In the end adjust with salt. Remove all stems from the basil leaves. The stems, in fact, not only contain water but also bring a bitter taste. Use a sweet garlic and always remove the green tip inside. 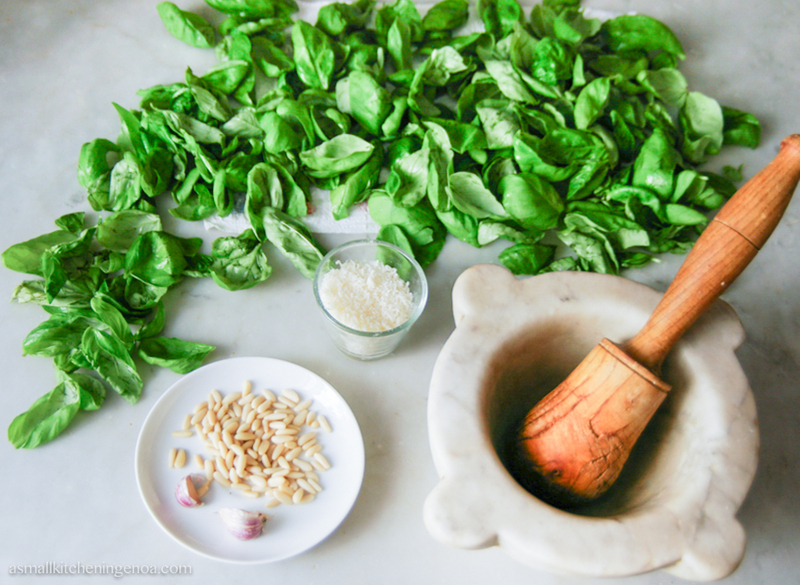 Never sharply cut or smash the basil leaves but gently rotate the pestle along the mortar walls, so that the leaves are “torn up” and free their essential oils. Use a seasoned Parmesan cheese. 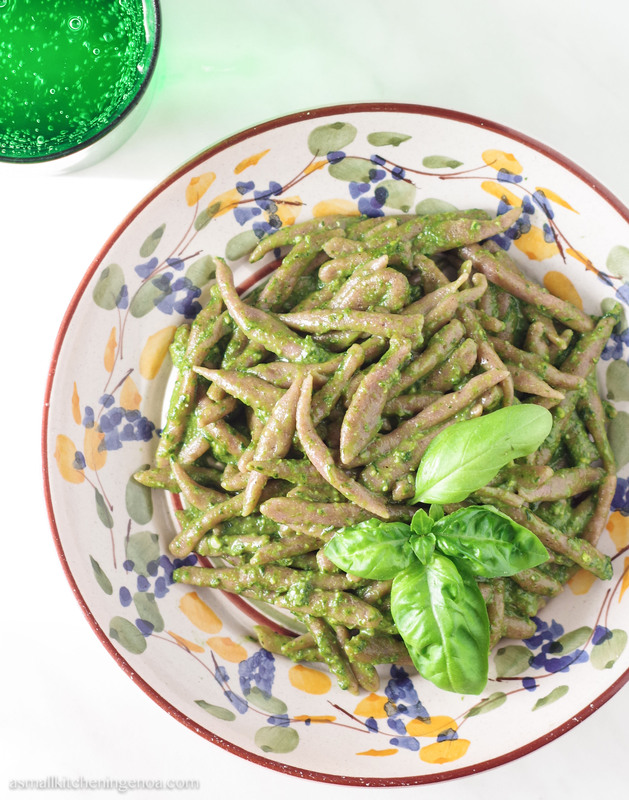 In addition to give a more intense flavour, it avoids pesto sticking to the bottom of the plate when pasta is seasoned. Taste during each step in the process and adjust accordingly, because garlic and basil are not always the same! The very secret of pesto is balance, the right equilibrium among all the ingredients! If the pesto comes out too salty, add less parmesan cheese and/or if necessary less salt to the pasta water. Finish the process as soon as possible to prevent the pesto from oxidizing. Cover the pesto with a thin layer of extra-virgin olive oil always to avoid oxidation. 1 + ½ tablespoon of parmesan cheese, grated. ½ tablespoon of pecorino cheese, grated. 4 tablespoons of Extra Virgin Olive Oil from the Italian Riviera and D.O.P. Wash the basil leaves with cold water and put them on a canvas to dry without wrecking them. They must be well dry before proceeding with the preparation of the pesto. Be careful to lift the whole stem, the stems in fact contain a lot of water and it could be difficult to smash the leaves in the mortar. Put a clove of garlic in the mortar, taking care to remove any inner green bit (that is the less digestive part of the garlic). Add 1/3 of the pine nuts and with an up and down motion of the pestel crush until it is reduced to a cream. Scoop out the garlic cream from the mortar and put aside. You will add it later. Begin smashing the basil leaves with a rotating movement along the interior walls of the mortar. Basil leaves should be "torn up" not pounded. In this way they release the essential oils contained in the internal veins. Pour until an homogenous cream is obtained. Add the remaining leaves, some more rock salt grains (be careful) and continue smashing. Finally, add the oil, stirring gently and making sure that the oil does not create an emulsion. After finishing the pesto, keep it under a light layer of oil to prevent oxidation. 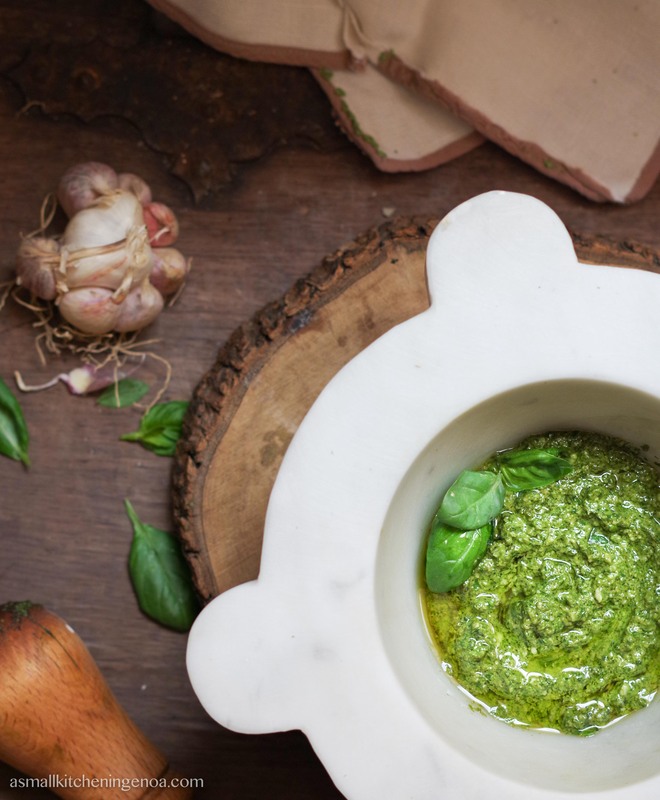 You would like to prove yourself hand-making pesto but miss marble mortar and pestle? No problem! You can buy them on-line. If you live in Italy or in Europe you can go directly to the Etsy online shop of La Marmotecnica, the biggest produces of marble mortar in Carrara (the mortars that Genoese actually use). If you live in the U.S. go on Williams Sonoma website, they actually sell the very marble mortars of La Marmotecnica. You have the right tools but miss the right basil? Why don’t you try to grow “sweet basil” (this is the right cultivar) at home? It is extremely easy! 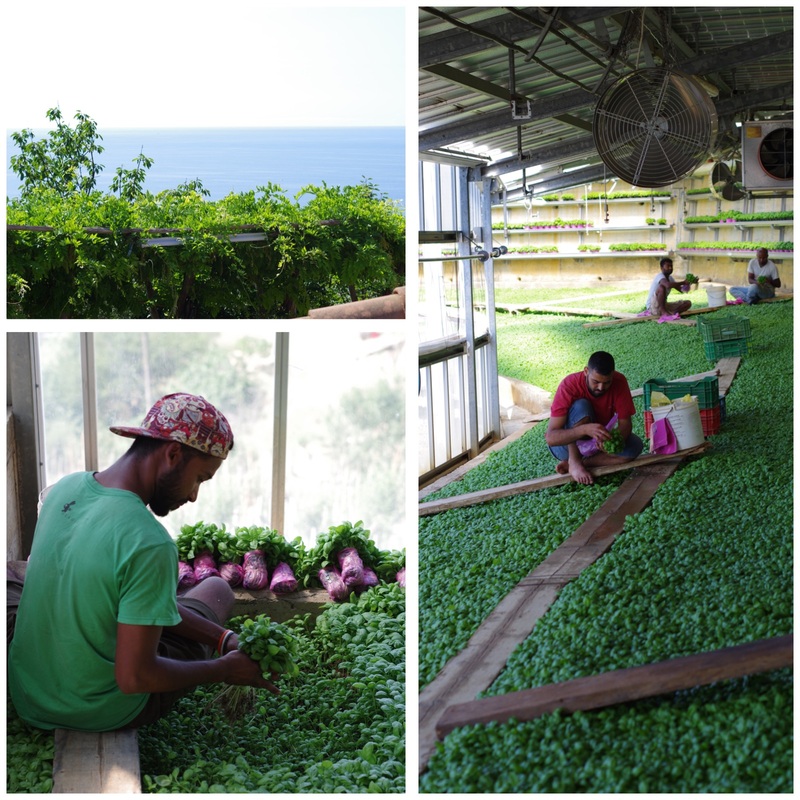 Have a look at the post “Everything you need to know about growing basil” published on the Kitchn magazine or to the two very complete articles on how to grow any type of basil both outdoor and indoor write on the website Loyal Gardener: “How to grow basil: the ultimate guide”. and on the website Electorsaw: “How to grow basil easily: pro tips to do it right” . If you are planning a trip to the Italian Riviera don’t miss the opportunity to come to Genoa, order troffie with pesto or trenette with pesto in a typical restaurant and maybe book a pesto cooking class with me! Finally, did you know that in Genoa, every two years, the Genoa Pesto World Championship takes place? It is an international competition for the best pesto sauce in the mortar (in 2016 I arrived at finals 🙂 ). The next competition will take place on 17 March 2018. If you want to take part and showyou skills in making pesto check out if a preliminary competition will take place in your Country, or register when free registration will open on mid February 2018. This will be a great opportunity to take part to a very funny and addictive competition and to visit Genoa too! Have a look at the website and keep up to date! Thank you for sharing this recipe. I just found your blog and it is beautiful and I can’t wait to try the recipes. My husband and I had a delicious pasta and pesto dish in Italy earlier this year and I can’t stop thinking about it. My attempts to make pesto at home have all fallen short. I look forward to trying this one. I wish we had Vessalico garlic in the US, it sounds wonderful. I look forward to reading your blog more! thank you indeed for your nice comment. Unfortunately I think you will not find in the Us vessalico garlic as it is quite difficult to sell abroad due to its perishability. However you can make a nice pesto with a normal garlic too, just be careful to remove the inner green core which is the more indigestible part. Look for some fresh basil, instead, with small leaves. That makes the real difference :). Thank you for sharing your recipe and information about the making of pesto, Enrica. 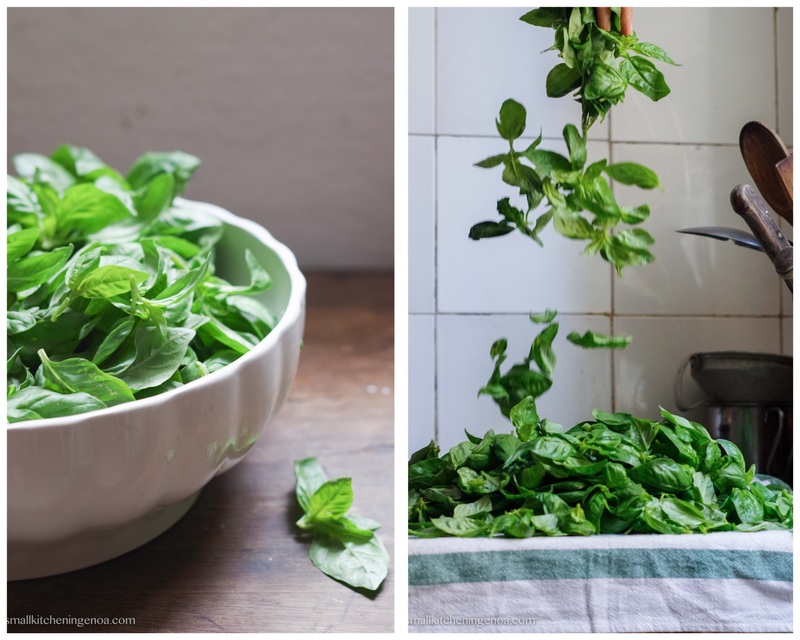 Your photos are beautiful and the tips for making the perfect pesto are much appreciated. 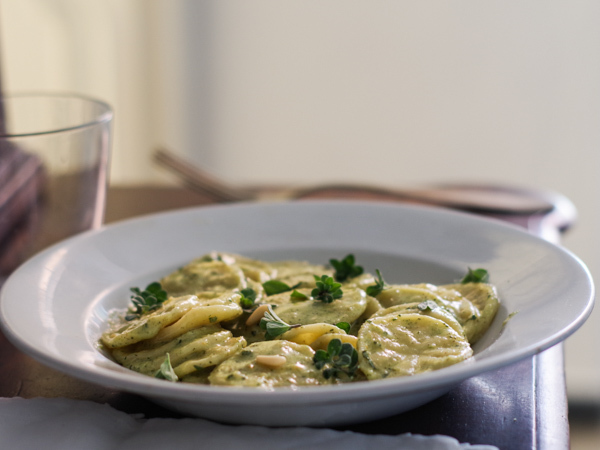 We are in bella Italia for three months and I look forward to using your pesto recipe and others from your beautiful blog to make traditional Ligurian meals. I LIVE IN MEXICO AND I CANT FIND FIORE SARDO. I CAN FIND PECORINO ROMANO, PECORINO TOSCANO AND SELVAGGIO SARDO CHEESES, AS WELL AS 24 AND 36 PARMIGIANO REGGIANO. COULD YOU HELP ME WITH WHICH CHEESES I SHOULD USE? THANKS SO MUCH I IM LOOKING FORWARD TO TAKE ONE OF YOUR CLASSES. MY HUSBAND IS FROM MILANO AND I WILL BE THERE SOON, I SURELY WILL GO TO GENOVA. Thank you for reading my blog! i look forward to cooking with you when you will come to Italy! I think that “selvaggio sardo” is indeed pecorino fiore sardo if it is a matured pecorino, salty and spicy. However to be on the safe side I suggest that you do pesto just with parmesan cheese (many geneses do not use pecorino in their recipe), the 24 or 36 months both work. The more matured will give a stronger flavor to your pesto. Good luck with your presto!